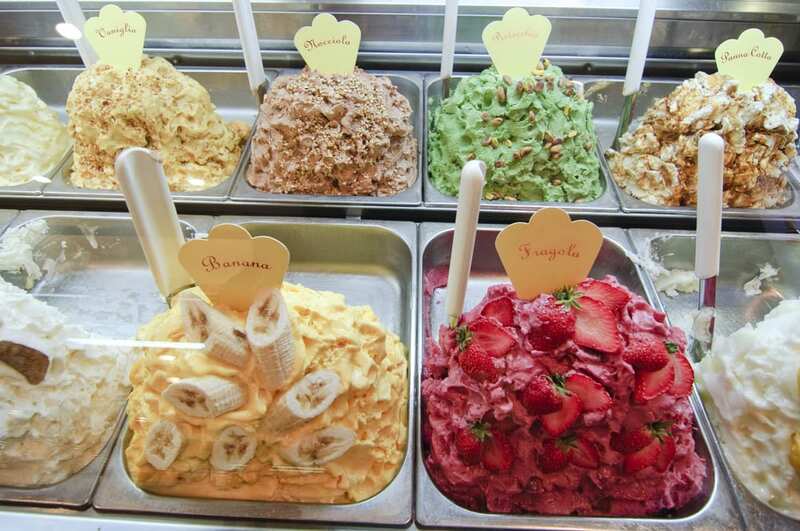 Home » All Articles » All around Italy » What is Gelato? What is gelato? Maybe the real question is... if it looks this good, do you care? What is gelato? Maybe the real question is… if it looks this good, do you care? No matter the season or region, there’s one Italian food that never fails to please: gelato. But what exactly is this Italian answer to ice cream? Where did it come from? And what makes it so different (and delicious!)? First, frozen treats aren’t new. Even in the times of ancient Rome, Italians ate confections made of ice or snow. (One recipe given in the 4th-century cookbook Apicius includes setting cooked meats and vegetables into a meat jelly, cooling the whole concoction, and serving it sprinkled with snow. Maybe not such a crowd-pleaser today). Anything closer to what we know as modern gelato, though, seems to have been developed during the Renaissance. Florence’s Boboli Gardens still have an ice-house built by the Medici in 1612, and a 1595 banquet in the city featured sculptures made out of sorbet. By the late 17th century, ice cream seems to have taken off. A recipe book even was printed in Naples, still one of the best places in Italy to try gelato, with a variety of delicious sorbet ideas, from ice cream thickened with candied pumpkin to gelato flavored with lemon blossom water. By the 19th century, we all screamed for ice cream — and in Italy, gelato (meaning “something frozen”) became the accepted word for the frozen treat. So if gelato just means “frozen,” what is gelato today… and why does it taste so different from the ice cream elsewhere? First, traditional gelato has way less butterfat. About 4 to 8 percent of gelato is butterfat, compared to 14 percent for ice cream in the United States. That means gelato freezes less solidly than ice cream (and it’s actually served about 10 to 15 degrees warmer than ice cream), so it melts in your mouth faster. Second, gelato has a much higher density. To make ice cream, producers mix cream, milk, sugar — and then add air, which increases volume, and water, which increases weight. But all that air and water makes for a much less-flavorful sweet. In Europe, meanwhile, regulations prevent you from that kind of process, called “overrun.” In Italy, you can’t legally increase an ice cream’s weight with water and volume with air. (That said, you can buy an industrial “mix,” add flavors, put it in stainless steel trays, and call it “artisanal”). Finally, most commercial ice creams elsewhere are made for long-term storage. (That’s why they’re more fully frozen and have a higher fat content). Gelato, though, is frozen quickly in small batches. That means it’s much fresher and higher-quality — and that truly artisanal gelato has to be eaten within a couple of days of being made. 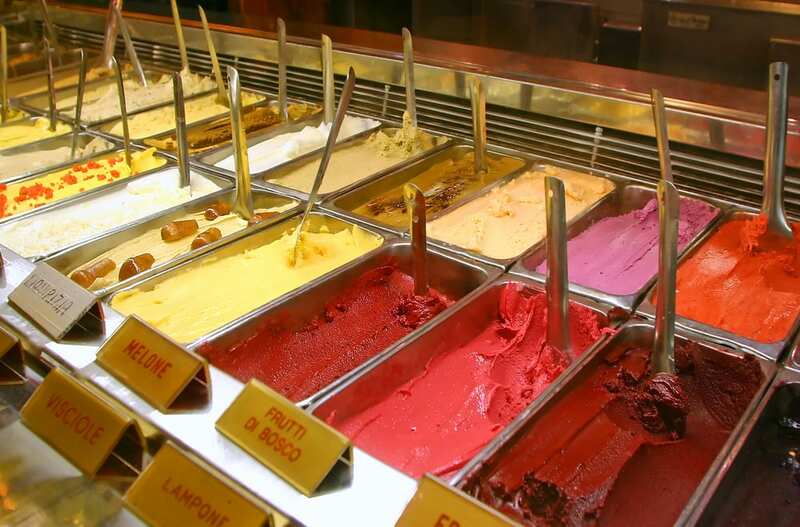 Find out here where can you actually try Italy’s best gelato! Don’t miss our Walks Traveler video on everyone’s other favorite frozen treat, granita, below! However gelato is made it’s delicious! In Aviano, Il Gelato, Coppa Nocioloso. Yum. By sheer coincidence, the same thing happened the next time I had gelato in Mumbai. I’m looking to make a really good experience of it here in Toronto, wonder where? Very interesting article, we love gelato too and we had published an article about it on our little blog. It’s in Italian, but it’s very similar to your. Take a look at it if you have time. U.S. ice cream, as regulated by the FDA, have a least 10% butterfat in it. Anything less would be considered Gelato. Love the history you provide in the opening paragraphs..
There’s a little mistake regarding the info provided in the video. Grattachecca and granita are two different things. Grattachecca is made with scraped ice blocks and then juices or syrups are added. In Granita juices water an sugar are mixed together and the frozen, thus anu single ice crystal is flavored.